Research helped us understand down syndrome. As I said earlier, we learned through our studies that children and adults with down syndrome can and will lead fulfilling lives. The future for our special children is bright and promising; education as well as job training is available to help people with down syndrome succeed. The misconceptions of previous generations are disappearing and society has become much more open to people of many disabilities. 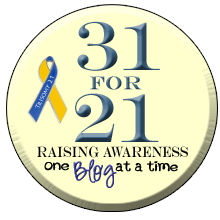 We realized very early on, that Alex and down syndrome would be in our lives forever, so we unconsciously began to incorporate down syndrome into our lives. After saying “Alex has down syndrome” a few times it became very easy to say, and was fully integrated in our conversations about our family. We told everyone we knew that Alex had down syndrome and we did not make a big deal about it. We took the position that this was a normal event in our family’s life and we were not sad or upset. It was almost like we were saying that Alex had green eyes and brown hair, to us down syndrome became a part of who she was, and who we were. The research we had done backed us up whenever friends or family wanted to probe further, but as people got to know Alex this became a non-event. We told Courtney about Alex, and although she was only 15 months old we used the term down syndrome a lot in our house. I do not think Courtney ever thought it was strange or weird; down syndrome is part of who Alex is. When Tom was born two years later he knew his sister was different, but he never questioned why. Courtney and Tom have become outspoken advocates of all children with challenges and are often cited by teachers as great examples to the other students. If I called a babysitter I would mention that Alex had down syndrome. If I called to enroll in a mom and tot class I mentioned Alex had down syndrome. If I called a healthcare provider I mentioned Alex had down syndrome. I never had any push back or hesitation from anyone who cared for our kids. 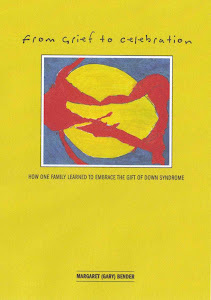 It was an easy transition and we embraced the two new words in our language; down syndrome. The verb incorporate moved us along our path to acceptance and embracement. It is our lives and those of all of our children. I am proud of Alex and am happy to mention down syndrome as often as I can.